There are several ways to control RGB lights, depending on the needs and specifications of the applicable environment. Trends in wireless connectivity and remote technology have allowed businesses to explore hands-off lighting approaches that are robust, inexpensive and easy to setup. Digital Multiplex Signal (DMX or DMX 512) controllers are commonly found in theaters, industrial facilities, concerts and outdoor events. The unidirectional system is capable of controlling up to 512 channels via software. Operators may sync the lights with music, dance numbers, video clips or keynote speeches. The controls can be pre-programmed and saved ahead of time, or setup to function autonomously. This option is scalable to meet extremely demanding light systems and configurations. “At a data level, the DMX512 controllers sends asynchronous data at 250 kbaud; 1 start bit, 8 data bits, 2 stop bits and no parity checking. Notice that although the data part is limited to 8-bit, some devices will combine two channels, giving a multiplexed 16-bit data packet if needed,” explained James Bruce from Makeuseof. DMX RGB controllers are reliable, but may be prone to interference from nearby electronics. Because of this, such systems are not suitable when used with flammable effects, such as pyrotechnics, where the risk of an electrical interference accidentally setting off explosives is considerably high. For elaborate configurations, it is recommended to use repeaters to maintain the signal quality of digital cables when used over long distances. Bluetooth controllers are ideal for wireless lighting applications. The system relies on a Bluetooth device that is connected to the RGB lights, acting as a bridge between the remote and lights. The remote that communicates with the Bluetooth controller can be a smartphone, tablet or a computer. In most cases, manufacturers develop their own apps that are designed to work seamlessly with the controller. Such configurations are ideal for both indoor and outdoor environments, with high-end controllers featuring waterproof designs. Businesses with complex RGB lighting requirements may find this option to be limited in application. This is because the operator must be within the radius of the controller in order to issue commands fluidly. The control radius for such devices varies greatly- class two units that transmit 2.5mW are capable of reaching 32 feet, while Bluetooth 4.0 gadgets can reach a maximum distance of 200 feet. Individuals may find that operating at the edge of the radius often results in delays and inconsistencies. To ensure reliable connectivity, companies will need to match the Bluetooth classification rating of the RGB controller with the intended application. 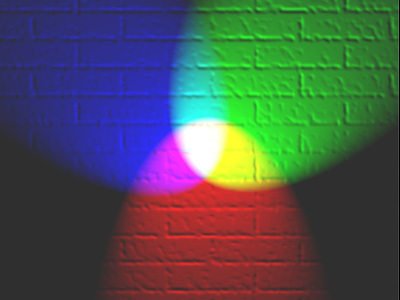 Wi-Fi can be used to control RGB lights remotely. This may be a viable option for facilities that already have a wireless network setup in the area. The transmission of data does not affect internet speeds, and multiple users may control the system with the use of third-party apps or additional remotes. The configuration consists of a router that is connected to a Wi-Fi controller, which is connected to the lights via wires. The remote (smartphone, computer, tablet or stock remote) connects and issues commands to the router wirelessly. This option is more flexible in terms of controlling radius and remote options, compared to Bluetooth RGB controllers. Operators can be in a different building, remote into a computer on the same Wi-Fi network and control various RGB lights on the system. Wi-Fi RGB controllers perform optimally in open environments, such as offices with open floor plans, industrial warehouses and outdoor settings. Facilities with thick walls and solid obstructions are not ideal for this lighting configuration, because it could limit the range of the Wi-Fi network. A feasible solution to this concern would be to deploy signal extenders in areas of the building where receptions are weak. For complex RGB lighting systems that require multiple room controls, businesses may group the lights accordingly and install zone receiving controllers for each area. This will allow operators to control the lighting conditions of each room individually. Wall RGB controllers are applicable upgrades for traditional light switches and outdated indoor lighting systems. This option features an elaborate panel, which serves as the remote, that is permanently mounted on a wall. High-end wall RGB controllers support a digital panel with touchscreen capabilities, smooth color wheels and audio notifications. Wired RGB controllers are connected to the lights via wires that are tucked away neatly behind the device. The controller’s input terminal wires are also connected to a transformer. Wireless RGB controllers are appropriate for facilities that require controls over multiple zones or rooms. Such devices can connect wirelessly to various zone controllers around the location. Each zone controller is connected to a different group of RGB lights. When issuing commands to individual zone controllers, the operator simply selects the zone on the panel, and data is transmitted via radio frequency to the selected controller.